where is the redox potential of the mediator, is the redox potential of the protein, and m is the number of electrons transferred for the mediator. 4. The mediator should be spectroscopically silent in the region of interest for the redox protein, or at least not create interferences with the protein absorbance spectrum in the oxidized or reduced form. Although we have shown that the presence of the mediator facilitates the protein-electrode electron exchange and allows oxidation-reduction of the Hbs and Mbs without influencing their structure and integrity,3 the kinetics and mechanism of electron exchange between hemoglobin and Ru(NH3)g+/3+ have not been fully described at this point. However, it is clear that because of its large size the ruthenium complex does not enter the heme pocket. Various detection systems can in principle be used to investigate the redox properties of proteins. Although we are describing a UV-Vis spectroscopy-based detection system here, infrared (IR) and emission spectroscopic detection can be developed on the same principle. Extensive reviews have been published on infrared, Raman, transmission, UV-Vis, and EXAFS (extended X-ray absorption fine structure)-based spectroelectrochemistry.5'81'82,84'86-93 Because both Mbs and Hbs have readily available UV-Vis spectral properties that differ upon oxidation-reduction of the prosthetic groups, we have based our technique on UV-Vis spectroscopic detection. where Eapp is the applied potential; £1/2 is the midpoint potential, at which 50% of the protein is oxidized and 50% is reduced under our specific conditions; R is the gas constant (J K-1 moF1); 7 is temperature in degrees Kelvin; n indicates the number of electrons involved in the redox process for an ideal system with nernstian behavior; F is the Faraday constant; and [Ox] and [Red] are the concentrations of oxidized and reduced species (M). The details associated with data analysis are described in Data Analysis (below). Myoglobins are a class of metalloproteins that contain a single iron(II) in a heme prosthetic group that can undergo a reversible one-electron transfer. The absence of subunits, such as found in the hemoglobins, precludes a cooperative response to redox, thus providing us with a system that exhibits nernstian behavior. Sample and Reagent Preparation. A stock solution of the electrochemical mediator, Ru(NH3)6C13, is prepared in a 0.05 M 4-morpholinepropanesulfonic acid (MOPS) buffer solution adjusted to pH 7.1 to give a concentration of 4.5 to 5.5 mJi. MOPS is selected as the buffer for its noncomplexing nature and stability, as well as the absence of spectral and electrochemical interferences. KNO3 (0.2 M) is used in this particular set of experiments as the background electrolyte. The presence of a background electrolyte facilitates solution conductivity necessary for an electrochemical experiment. It is important to be systematic in the choice of the electrolyte in order to minimize the different kinds of species in solution. For example, because the bridge solution that connects the reference electrode and the working solution is composed of 0.2 M KC1 (as described in Spectroelectrochemi-cal Technique and Cell Design above), a potassium salt is used as the background electrolyte. The presence of K+ on both sides of the agar gel connection minimizes the errors associated with a junction potential across the reference-working solution interface. Nanopure water is used at all times and all solutions are stored under an N2 atmosphere at 4°. For each experiment, a solution containing 0.2 M KN03, 1 mM Ru(NH3)6Cl3, and 0.05 M MOPS at pH 7.1 in a 5-ml pear-shaped flask is connected to a vacuum line for repeated pump purging with N2, followed by addition of Mb and additional pump purging with gentle swirling to minimize bubbling. Final concentrations are typically 0.06-0.08 mM in heme. 115 mM_1 cm-1.4,6 The extinction coefficients for the oxidized species [met-Mb; iron(III) Mb] at 435 nm are negligible. A typical increment of 20 mV is applied to the system, starting at approximately +300 mV (fully oxidized met-Mb) and ending at —120 mV (vs. NHE) (fully reduced deoxy-Mb). Although most experiments are performed by proceeding from fully oxidized to fully reduced Mb, the system is reversible under our experimental conditions and can be performed in either direction. From the recorded spectral changes (Fig. 2) and applied potential, Nernst plots are developed as described below. Fig. 2. 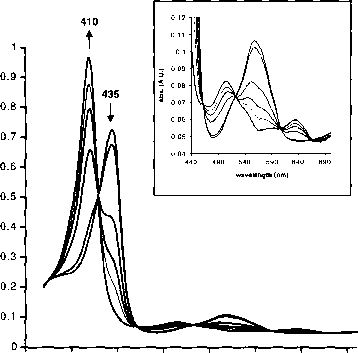 Representative data set obtained by spectroelectrochemistry during the oxidation of horse Mb, showing a decrease in the absorbance at 435 nm in conjunction with an increase in the absorbance at 410 nm. Inset: Enlarged area showing the presence of four of the five isosbestic points at 462, 522, 606, and 662 nm, respectively. where A(E) is the absorbance of the solution at equilibrium for any applied potential £app, A0 is the absorbance of the fully oxidized protein (at +400 mV vs. NHE), and Ar is the absorbance of the fully reduced protein (at —250 mV vs. NHE). Fig. 3. 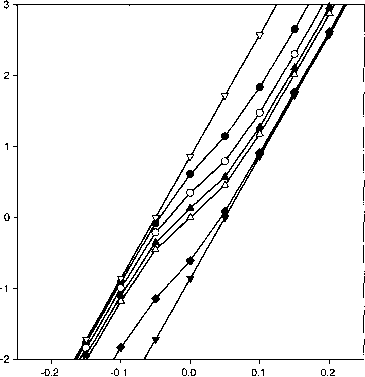 Representative Nernst plots for horse Mb in 0.05 M MOPS, 1 mM Ru(NH3)6Cl3, 1.0 M KNO3 at pH 7.1, 20°. Data analysis was performed at two different wavelengths, 410 nm (•) and 435 nm (O), and shows the overlap of the Nernst plots in comparison with a representative Nernst plot for Aplysia Mb (a) obtained at 435 nm. and Aplysia myoglobins are illustrated in Fig. 3. Although only one wavelength needs to be monitored to obtain a Nernst plot, it is good practice, when possible, to monitor the wavelengths of maximum absorbance of the reduced and oxidized forms of the protein (i.e., absorbances at 410 and 435 nm in the case of the myoglobins). 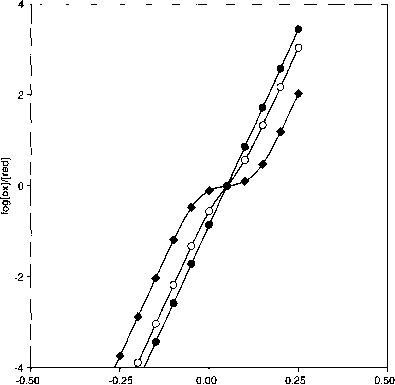 The Nernst plot derived from each monitored absorbance change should overlap to give the same Em and n values (Fig. 3). 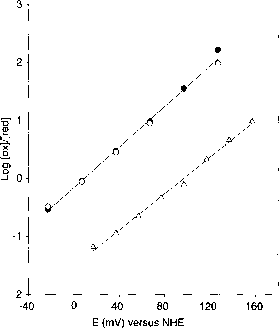 In addition, if a protein has characteristic isosbestic points for its reduced and oxidized forms, denaturation and a change in concentration of the protein can be monitored by evaluating how "clean" these isosbestic points are as the oxidation or reduction experiment is performed (Fig. 2). This is an important spectroscopic tool that we have used systematically to evaluate the quality of our data for both the Mbs and Hbs. = 113mA/ 'cm 1, andfc = 0.3mm. [Reprinted from C. H. Taboy, C.Bonaventura, andA.L. 95 J. F. Taylor and V. E. Morgan,./. Biol. Chem. 144, 15 (1942). it is important to be alert for possible deviations from linearity in the Nernst plot. Such deviations can signal a poorly designed or malfunctioning experiment, or may indicate the presence of a more complex system. In the latter case, there are two scenarios that can lead to a nonnernstian response. The first case (scenario 1) involves two (or more) noninteracting redox groups. This results in a deviation from linearity of the slope in the Nernst plot and is sometimes referred to as negative cooperativity. However, this behavior is, in fact, associated with the presence of two noninteracting electroactive species with different E\a values. This scenario can occur within a unique protein possessing two noninteracting electroactive centers or within a mixture of two or more redox-active proteins, as long as a difference in their respective E\n values is present. 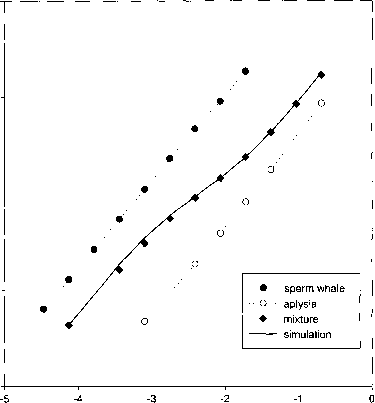 Below, we show that a theoretical model describing this behavior accurately predicts and precisely the experimental data obtained for a mixture of Aplysia and sperm whale myoglobins, for which a difference in £1/2 of 80 mV has been demonstrated.84 The second case (scenario 2) involves two (or more) redox centers interacting with one another and is observed experimentally when studying the hemoglobins. Intracellular hemoglobin typically possesses four interdependent heme centers that have the ability to communicate with each other. These heme-heme interactions aid in the efficient uptake and release of dioxygen, a phenomenon known as cooperativity. The presence of a slope corresponding to n > 1 (nonnernstian response) for the hemoglobins is linked to the intrinsic electronic properties of the protein and gives information regarding the ability of the four prosthetic groups to influence each other electronically. These two examples (scenarios 1 and 2) of nonnernstian response are different in nature and cannot be overlooked when analyzing the results from a spectro-electrochemical experiment. The following model is designed to predict the behavior of a Nernst plot when a mixture of two noninteracting but well-behaved nernstian electroactive species is studied by spectroelectrochemistry (scenario 1 described above). Two cases are developed. In one case the two species have identical spectra, but different midpoint potentials, and in the other case the spectra and midpoint potentials are both different. where E Ar and E A0 are the sums of the absorbances of the fully reduced and fully oxidized species A and B, respectively, and E Ae is the sum of the equilibrium absorbances of the oxidized and reduced forms of species A and B at a specific applied potential. Because the oxidized Mb species have a negligible absorbance at 435 nm, Eq. (5) may be simplified to Eq. (6). may be substituted for [0A] and [Ob] in Eq. (3). Using the mass balance Eqs. (9) and (10), we can relate the applied and midpoint potentials E and £1/2 to the absorbance levels via Eq. (11). The symbols cA and cB represent the total concentrations of species A and B, respectively. Data simulations derived from the log plots of Eq. (12) are shown as solid lines in Figs. 4, 5 and 6.
equivalent, but do not influence the electronic properties of one another. As the difference between the midpoint potentials (AEia) of the two independent species increases, a clear increase in the deviation from linearity around the midpoint potential can be observed, as predicted on theoretical grounds.5 For this hypothetical system, where eA = £b, it is important to note that the minimum slope is still found at the midpoint potential (Em). 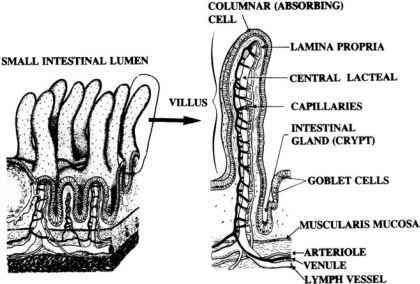 important points are illustrated in Fig. 6: (1) One of the redox species must have an extinction coefficient at the probe wavelength that is much larger than the other (e.g., £a/£es = 1 : 9 or 9 : 1) in order for the Nernst plot to become tangential to the respective single-component plot at extreme applied potentials; and (2) if there is a difference between the extinction coefficients for the two species at the probe wavelength (êa and êb), the minimum slope will not be present at E\p_, but will shift as a function of the ratio of gA to eB. Clearly, the Nernst plots for a mixture of two noninteracting redox systems of different spectra and midpoint potentials will deviate from ideality (linearity). If the system is functioning properly the shapes of the Nernst plots are diagnostic of the presence of two or more heterogeneous electroactive centers, as illustrated in Figs. 5 and 6. We can experimentally verify the model calculations described above, using a mixture of Mbs. When a 1:1 mixture of horse and sperm whale Mbs is studied by spectroelectrochemistry, a well-behaved Nernst plot is obtained with a slope corresponding to n = 1 and £1/2 = 17 mV, which is equivalent to the £"1/2 obtained for the individual species (results not shown). 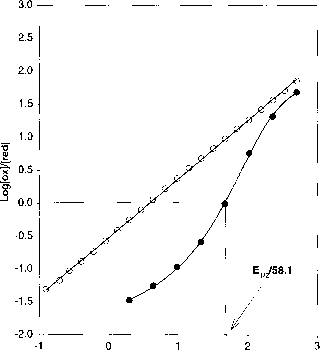 This is the expected result as these two Mbs have identical spectra and Em values when isolated from each other and act therefore as a single homogeneous protein, spectrally and electronically "identical" to each other. Mixtures containing Aplysia and sperm whale Mb, however, give a reproducible nonnernstian plot, as anticipated by the model described in the previous section. This is due to a difference in their respective midpoint potentials (A£i/2 = 80 mV). Nernst plots for Aplysia and sperm whale Mb alone, and in 1:1 mixture, are presented in Fig. 4 along with a simulation for the mixture. 96 B. G. Malmstrom, Q. Rev. Biophys. 6, 389 (1974). sperm whale Mb, illustrating the sigmoidal shape of the Nernst plot for Hb Ao. Four parameters are used to describe Hb responses: the midpoint potential (£1/2) and the potential at which the maximum slope of the Nernst plot is observed (£max) and, because the slope of the Nernst plot is constantly changing, we also define the n value at the midpoint potential as «1/2 and the n value at the maximum slope as "max- These parameters permit comparison of each data set as a function of the specific midpoint potential (Em) of the system and its level of cooperativity (as described by the slope at the midpoint potential, «1/2), and give a general sense of the asymmetry of the curve (\E\n — Emax|). 97 A. Szabo and M. Karplus, J. Mol. Biol. 72, 163 (1972). 98 K. D. Vandegriff and R. M. Winslow, "Blood Substitutes: Physiological Basis of Efficacy." Birkhauser, Boston, 1995. 99 J. P. Collman, R. R. Gagne, C. A. Reed, T. R. Haibert, G. Lang, and W. T. Robinson, J. Am. Chem. Soc. 97, 1427 (1975). 100 X. Hu and T. G. Spiro, Biochemistry 36, 15701 (1997). 101 H. X. Zhou, J. Biol. Inorg. Chem. 2, 119 (1997). 103 F. A. Tezcan, J. R. Winkler, and H. B. Gray, J. Am. Chem. Soc. 120, 13383 (1998).